In the latest DLC Bespin for Star Wars Battlefront, you get a lot of new content and also new challenges such as sabotage, for which we were able to gather some useful tips. You move into a completely new area, which can be found on the gas giant Bespin. With our tips and tricks you will be able to survive in the new mode sabotage. In this mode, you have another chance to fight in a team consisting of up to 16 players against another team (also up to 16 players). Each match at sabotage consists of two rounds. During the first round Rebels have to destroy three generators, while the empire tries to stop them. If they succeed within ten minutes, sabotage in the second round and the rebels must now try to protect the pick-up zones. The following tips and tricks will help you to gain sabotage. - Stun grenades: Use the new stun grenades best against groups of opponents. You can fix it and just shoot. - Cooldown: With Bespin the interaction gets more support. This means that your cards recover faster when you stand near your partner. - EE4 and X-8: Test of the new weapons, because they are not so bad. Especially the EE4 convinced us. However, you can take it you only in melee or at intermediate distances. - You should not destroy a generator after the other, but try you divide and edit all three simultaneously. If at the end that is for a long time only one generator left, the entire army will gather here and the battle for the generator is very difficult. - The Empire receives in the first round no heroes for reinforcement, so use your chance and grab the four heroes who are available to you. However, you must not let them die, because they don’t return, and in the second round you get the Empire heroic support. - The object of the other is thus to protect the few heroes. - The new hero Lando Calrissian has the ability to put traps. - When you see on the field in the first round hero, then they tried to kill because they are not again to spawn and if sabotage is entering the second round, the rebels have less heroes available than you. - Be careful when you collect power ups. Behind the bonuses there can be hidden traps that will kill you. However, you have a way to detect them because they rotate in the opposite direction as the real power ups. 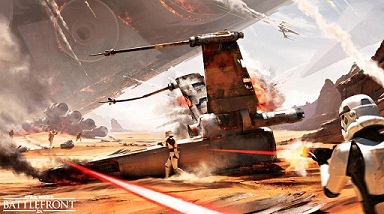 - Have you wiped the heroes of the rebels in the first round, the game for you in the second round will be much easier. Nevertheless, you must ensure that your heroes are not killed.